There are a few options to have your iPhone pictures printed. There are services that will print your iPhone taken image onto a postcard and mail it. Most of the services lean towards square prints so you can do something with your Instagram and Hipstamatic images. A new provider, PostalPix, is expanding on what others are offering. 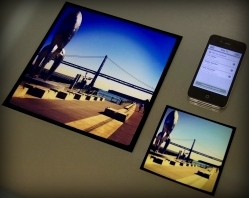 PostalPix will print your square images and mail to you or to someone else in the 4×4, 5×5 and 8×8 sizes. They also have the 4×6, 5×7 and 8×10 non-square printing covered. If your looking for using your images for a bit of art, PostalPix will infuse your images onto aluminum, all ready for the office or home walls. The free app handles everything from accepting your iPhone images, choosing the size and paper, aluminum or mousepad, to paying.